The best commercial cabinets Tulsa can find are from none other than A&S Millworks! We do all types of custom cabinets, and that includes commercial cabinetry. We do more than just residential work. We also send our expert team for commercial jobs of any size. No matter what type of business you run, we can help you maximize your space to get the most out of every room. Commercial cabinets can be used for banks, offices, retail stores, doctors’ offices, and much more. From storage to work areas, A&S Millworks can meet the needs of any type of business. We customize each commercial project just like we would a residential cabinetry project, so even though commercial cabinets aren’t known for their beauty and style, they’ll be expertly designed and professionally installed the same way the cabinets in your home are. A&S Millworks has done commercial cabinet jobs all over Tulsa. We listen to the customer and determine what their priorities are so that we can get a good idea of what features would benefit them most. 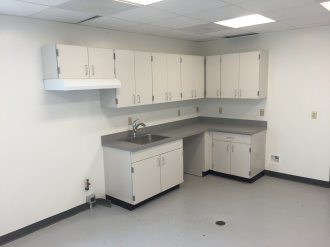 We have installed lab cabinets with islands, bookcases, workstations with open storage, and break rooms. These are standard jobs where custom commercial cabinets are a good idea. Some customers looking for help with their home offices or reception areas should also look into our commercial cabinets. They are a smart, polished way to finish off any work area! Waiting rooms, exam rooms, and procedure rooms need lots of storage, and it needs to be easily accessible to the doctors and nurses. A&S Millworks can provide locking and non-locking storage solutions for all types of businesses including doctors’ offices. Just because your office is a place of business doesn’t mean it has to look boring or institutional. We have the commercial cabinets Tulsa business owners need to make their entryways, reception desks, offices, and both beautiful and functional. Computer stations, group work centers, and bookshelves need to be heavy duty and easy to care for when they will be used by many students every day. A&S Millworks has lots of options that will work well in any classroom, from pre-school to college. Let A&S Millworks show you some examples of our past commercial cabinet projects. We’re sure you’ll be amazed at what we can do with small, outdated, and boring spaces. Commercial cabinets are also tough, so they’ll last a long time, no matter what your employees and customers put them through! Locker rooms and gyms need both open and closed storage of all sizes. Only A&S Millworks can design an area that allows all members to access their personal property as well as communal items. You can store items safely and neatly with commercial cabinets. Laundry rooms, mudrooms, and garages need storage, too! Add commercial cabinets for a sleek way to get things out of sight. Using commercial cabinets in your bathroom or kitchen is a unique way to give those rooms a modern look.